Welcome to MTR Custom Leather’s Blog. Here is an up to date on some new weapons that we are offering to fit our holsters. If you do not see your weapon than please call or email to see if we can get that weapon to make a mold for a holster for you. Why does a woman need to carry? A lot of women these days are not thinking about protecting their self. They are relying on their significant other or someone else too. Some women say, “oh it’s too heavy to carry a weapon in my purse” or “I can’t wear holsters on me because I wear fitted clothes”. There are many excuses to why not to carry but there is way more reason to why NOT carry? Coming from a women, that I am, I have been in a few difficult situations where I needed a weapon for protection and in some cases where the weapon saved my life. Several years ago I was in college in our local gym taking some extra PE classes to get in shape. As you know, in the state of NC you can’t carry a weapon on campus, so therefore I could not bring my weapon with me. So I went with plan B, bring my stun gun. FYI, a stun gun is not classified as a weapon, however, a Taser is, big difference. We will discuss this in another topic. So back to the gym, I was in the locker room changing from my swim class and just so happened I was a lone, nobody else in there. FYI again, try to always have a gym buddy or have somebody with you. While I was changing, a tall muscular man walked in the “WOMENS ONLY” locker room and came close to me and just looked at me. It felt like several minutes, however I knew it was probably only a few seconds. I was so scared and my adrenaline was raging. I was thinking of so many different tactics that I could do to protect myself. The tall man was standing between me and the locker door entrance. So, I looked at the locker room door as if someone was coming in and the man looked too. As soon as I knew that he was not watching me I reached for my stun gun real fast and I started to press the shocker not actually at on him, but very close to where you could feel the “heat”. I started to yell and shout, “GET OUT OF HERE”. The tall man ran for his life out of that locker before I could do anything else. After he ran out, I did too, I chased him out of the gym door. After he was out of sight, I went and reported him, I never saw that man again in the gym. So ladies, it is very important to always have some sort of protection whether it be a weapon, stun gun, Taser, knife or etc. I will discuss in later topics different weapons for protection. Whatever you decide to carry than please be trained at carrying it and using it. Be prepared. New Lasers/Lights for Sept-Oct 2015..We now make holster for the following lasers and lights. If you do not see your laser or light than please contact us to see if we can. Everyone wants A’s on their report card right? Well why not for carrying your weapon too? The 5 A’s can help you decide whether pocket carry is right for you. There are many ways to carrying your weapon in a pocket. Whether you carry in the back pocket, front pocket, jacket pocket or a cargo pocket, it’s all an excellent way to guarantee you have a weapon when you need one. Just remember the 5 A’s when considering carrying in the pocket. Acquainted Routine-Most everyone has pockets and carry things in their pockets. It’s a natural regimen to stick your hands in your pocket, or grab things from your pocket or even rest your hands in your pocket. Your average person would not think of a weapon being in your pocket these days. Due to most people have cell phones that are larger than a small 380 or 9mm weapon. With that being said, there is not much discomfort when carrying a weapon in the pocket because one is already use to carrying large things in their pocket. When one gets into a routine of carrying a weapon in the pocket, one never remembers that there is a weapon in the pocket, it’s too familiar. Awareness is at ease and concealment is easy-When carrying in the pocket, one of the greatest advantage is that the weapon is not noticeable. The mind is at ease when you don’t have to worry about your weapon showing. A lot, of people stress when carrying a weapon in certain places due to they’re afraid of their weapon showing when they move or sit. This can cause problems if you are in a situation and you need to draw your weapon. When concealing your weapon you need to be at ease and comfortable. Affordable- The price of a pocket holster is usually the same price as a descent wallet. Keep in mind that a good made pocket holster may not be cheap, but who wants to carry a $300 weapon in a $20 holster. Attire- To start with your attire dose not usually affect the clothing you wear. One could wear a suit and tie and carry the weapon in the pants pocket or jacket pocket. In my opinion, 80% of pants have pockets and 90% of jackets have pockets. So you have one less thing to worry about when thinking about carrying your weapon. Access is relaxed- As stated in the acquainted routine, it’s a natural routine to stick your hands in the pocket for a numerous of reasons. So access to your weapon may be more of a natural response to someone else. Which will make it feel more relaxing to one as well. One does not have to take about twisting the weapon a certain way to release the weapon or pressing a button to release the weapon. The weapon is easily accessible to draw, however it may not be the fastest, but it’s one of the less complicated ways. Check out our blog for more tips about carrying in the pocket, pocket holsters and the right pocket carry weapons. New Lasers/Lights for Aug 2015..We now make holster for the following lasers and lights. MTR Custom Leather presents, “The Punisher Rig”. The Punisher rig is a double weapon shoulder rig. The Punisher rig allows for easy draw of the weapon, allowing one to bring their weapon on target in one motion. The weapons sit horizontal below the armpit. Each holster on the Punisher Rig has a metal thumb break tab to give a extra security of your weapon in the Punisher rig. The Punisher is equipped with heavy duty nylon stitching and stainless steel hardware, which allows you to adjust the ride height of your weapon that is suitable to you. MTR Custom Leather designed each connection to swivel for comfort and continuous wear. The Punisher rig is all high quality bull hide leather, no plastic (kydex) or nylon. MTR Custom Leather gives you the option to add double stitching to your Punisher rig (around the holsters only), this option will add stiffness and durability to the holsters (see picture for example). Also, adding an enclosed barrel is another great option for your Punisher rig, this enables dust and debris from entering your barrel. The Punisher rig is a great choice of shoulder rig to aid in emergency situations where you may need to shoot with your non-dominate hand. This punisher rig gives you the option to draw with either or right or left hand. The Punisher Rig is custom made to be fully adjustable to fit most anyone. The Punisher Rig is custom made for right or left handed shooters. Extra training may be exercised for shooting with this rig. There will be a comment box at the end of checkout and you can let us know the gun type of your second weapon, if you are wanting 2 different weapons for the one rig. On large DA (double action) weapons the thumb break is placed decocked. Smaler SA/DA (single action/double action) weapons the thumb break is placed cocked and locked. If you would like your thumb break placed differently, then please add that in the comment section and call 336-879-2166 or email sales@mtrcustomleather.com. 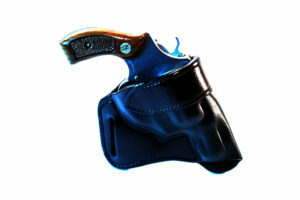 There is additional $15.00 charge for change in pattern of holster. 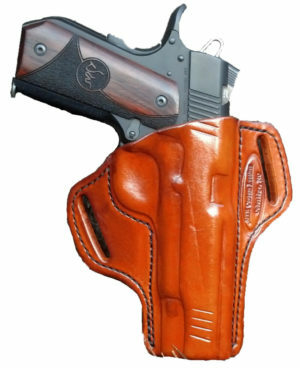 No refunds or exchanges on custom items (like this holster). 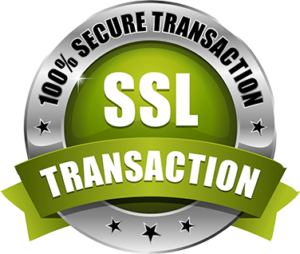 NOTE: If you need more info, or would like something done differently please call or e-mail us with your custom request. New Duty Gear for 2015..Check it out!! 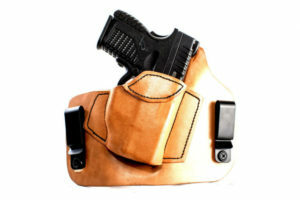 MTR Custom Leather brings to you our Light and Mag Carrier (quick-snap version) combo. Our light and mag carrier is designed for comfort, preparedness, accessible and convenient. You have you light and magazine in one place that is easy to access without seconds loss in time of emergency. The dimension of the light is 1” in diameter (standard). The magazine is available for a variety of different calibers. You have the option for right or left hand carrying. This means that if you are right handed than the light and mag carrier is worn on the left side of the body with the magazine in front of the light. On the flip side, if you are left handed, than the light and mag carrier is worn on the right side with the magazine in front of the light. MTR Custom Leather custom makes the magazine to where you can carry it ambidextrous. The pouch is designed to allow you to carry your ammo with the bullets facing forward or back. The quick-snap version has on leather strap with one directional snap on each side. This helps to bring in the pouch closer to the body for concealing. By doing this you are printing less. By the wideness of the light and magazine carrier you are helping to distribute the weight of the pouch. The belt slots can fit up to 1-1/2 gunbelt(2 layer) or 1-3/4 regular belt (1 layer). MTR Custom Leather brings to you our Light and Mag Carrier (quick-snap version) combo. Our light and mag carrier is designed for comfort, preparedness, accessible and convenient. You have you light and magazine in one place that is easy to access without second loss in time of emergency. The dimension of the light is 1” in diameter (standard). The magazine is available for a variety of different calibers. You have the option for right or left hand carrying. This means that if you are right handed than the light and mag carrier is worn on the left side of the body with the magazine in front of the light. On the flip side, if you are left handed, than the light and mag carrier is worn on the right side with the magazine in front of the light. MTR Custom Leather custom makes the magazine to where you can carry it ambidextrous. The pouch is designed to allow you to carry your ammo with the bullets facing forward or back. The paddle version you can adjust the ride height and you can cant the pouch forward or reverse about 15 degree. MTR Custom Leather added 2 retention screws in the center of the pouch between the light and magazine to allow for maximum retention and comfort. The light and magazine paddle grips inside the waistband, no belt needed; however, the bottom of the belt will help enable easy on and off without removing the belt. You can no longer be in that percentage of people shooting in low light anymore. Because now you have a light and magazine paddle pouch to secure each in case of an emergency. Check out our FAQ page on more information about directional snaps and how to use them.